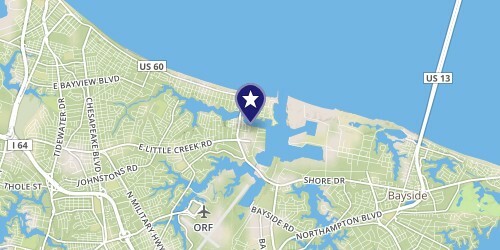 We’re conveniently located on the south shore of the Chesapeake Bay in Norfolk’s Ocean View area on Little Creek Inlet. Please contact us with any questions, we look forward to speaking with you. From Thimble Shoals channel marker 13 head due south to the 1LC buoy and the entrance to Little Creek. Once inside the jetties take a starboard turn at daymarker 8 into the pleasure boat basin. We are the first marina on your port past the navy ships.